(A) For appointment In Grade Pay Rs. 1900/2000 (Level- 2 OR Level- 3 of Pay Matrix as per 7th Pay Commission); 12"' (+ 2 stage) or its equivalent examination. (i) 10th pass plus National Apprenticeship Certificate (NAC) granted by NCVT OR 10th pass plus ITI from institutions recognized by NCVT/SCVT for posting in Electrical. Engineering, Mechanical and S&T departments. (ii) pass OR ITI from institutions recognized by NCVT/SCVT OR equivalent OR National Apprenticeship Certificate (NAC) granted by NCVT for posting in departments other than those mentioned above. Proof of Age vi&, Matnculation certificate issued by a recognized board or equivalent must be produced. Age: Minimum 18 years and maximum 25 years as on 01-01-2019 (between 02-01-1994 to 01-01-2001). How to Apply: Candidates fulfilling the eligibility criteria should apply as per application format given at Annexure-A by the candidate in his/her own handwriting on a good quality A-4 size plain paper along with two recent (taken within last two months) passport size photographs duly self-attested without weanng any wig, cap or colored glasses, The application should be duly filed and signed by tne candidate in own handwriting. Applications must be sert through ordinary post addressed to Asstt. Personnel Officer (Recruitment). Northeast Frontier Railway HQ, Maligaon. Guwahati — 781 011 (Assam) OR dropped in the APPLICATION BOX (separate boxes for Group-C & D) in the Recruitment Section in the Office of Pr Chief Personnel Officer, N. F Railway HQ Mal.gaon. Guwahati (Assam) on or before 10-09-2018. (For candidates residing in Andaman & Nicobar Islands, Jammu & Kashmir. 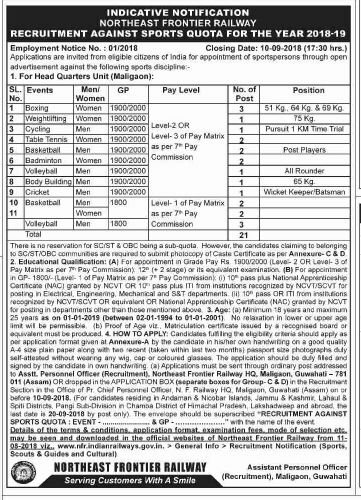 Lahaul & Spiti Districts, Pangi Sub-Divisjon in Chamba District of Himachal Pradesh, Lakshadweep and abroad, the last date is 20-09-2018 by post only). 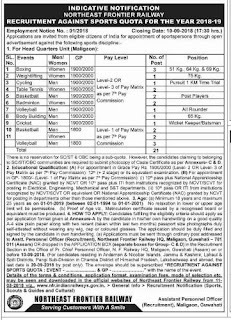 0 Response to "NF Railway Guwahati Jobs 2018-19 For 21 Sports Persons Posts"